Whee! I made Erin watch this, even though I knew he wouldn't get it. And if you haven't seen the rest of Ranma 1/2, you won't get it either. I am fascinated by Japan's adoption of bits of Christmas. It's not a national holiday there, very little of the population is Christian, they have just decided that it's an excellent excuse for a party. Even just from what I can tell by watching a few anime holiday episodes, Christmas is seen as a time to have fun, give small cute gifts, and go out with your romantic partner. I approve. 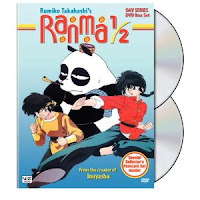 Ranma 1/2 is one of the few anime that I have made the time to see all of, because it amuses me to no end. This episode is one of the OVA series, which is to say it was a video release, not part of the initial TV run. The similarities between this video from Gratuitous Art Films and my nightmares over the past week are simply too numerous to be dismissed as coincidence. Thanks to Gratuitous Art Films for sharing. 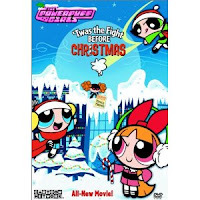 This is one of four "specials" that came on a DVD titled "The New Christmas Classics" I found at Best Buy for a whopping $4.99. When the back said "George of the Jungle," I was hoping it was the original series. Instead, it wound up being from the new Cartoon Network series. There were a bunch of shorts included, but only two that were Christmas themed: two halves of a Christmas episode. The first short, Jungle Bells, had Ursula trying to explain Christmas and bring it to the jungle. I was disappointed that it was the new series, and I was trying not to like this. But I failed. It was funny, and it grew on me pretty fast. By the time George searched the world looking for Santa, I was chuckling. This half-hour special from the 1970s tells the heartwarming story of a stoned bear who is tricked into a life of slavery by Santa Claus. The first few minutes are somewhat intriguing. There's a "bear city", where a large number of anthropomorphic bears live and work. There's a lot of attempted comedy around the supporting characters and the honey factory where they all work; a few of the jokes are actually worth a chuckle. The designs exist somewhere in that nebulous region between Yellow Submarine and Dr. Seuss, and, while they're not bad, they're not exactly inspired. While the rest of the bears are getting ready to hibernate for the winter, our intrepid hero, named... ergh... Ted E. Bear... wants to stay up and find Christmas. On some level, this album facilitated the experiment that is this site. As such, I'm not sure if I should be grateful or angry at Amazon for making this available. It turns out that if you want classical music, Amazon is happy to provide it in bulk for very little money. I'm sure a lot of these recordings - or at least similar ones - are available for free, but this saves me the time of having to scour the internet for options. I'm not sure the price will last, but I actually got this for $1.99, meaning I paid about two cents a song. The recordings aren't fantastic, but then neither is my sound system. The sheer number of pieces means I can put this on random and listen for hours on end without hearing the same songs over and over again. 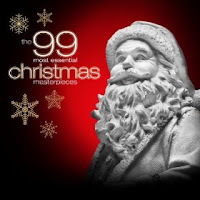 Highly recommended if you want a collection of holiday music without the hassle that goes along with putting it together yourself. When he said, "I've come for the mail," it was in a plain voice, deeper than average, but certainly not so deep as to be described as baritone or bass. Nevertheless, one doesn't expect to hear a voice so deep from a man so skinny as the one who walked into the Torytown, Ohio post office, and Rita Yoring was obliged to give the visitor a more thorough look-over. He was indeed thin, barely the proverbial skin and bones. He was wearing spectacles, which until that very minute Rita always believed to be another term for eyeglasses, rather than a distinct object, but there was no mistaking it: these were indeed spectacles. They had to be. He wore a business suit, not a flashy one, but it had certainly been tailored to fit, and he had a fedora pulled down over the tops of his ears. "Do you have a PO box?" Rita asked. We've been watching Christmas specials every day for over a week now. I can feel my mind starting to splinter around the edges. I practically strangled poor Erin, and then hid under the covers for the duration of that pile of crap. I really feel like tomorrow should be Christmas already. If it isn't, then WHY CAN'T I STOP THINKING ABOUT IT? Seriously? Not for weeks? I might explode before this is over. It's been a very long time since I've seen any Goof Troop, one of my least favorite series that was part of the Disney Afternoon lineup. The holiday episode is cute, but odd, and exemplifies what I remember about the series. That means it has the strengths of the series: family stories, told with heart, with the occasional very funny line. That also means it has the weaknesses that plagued the series: unrelenting ill luck that isn't actually funny, and an awkward mesh between the character based humor and the over-the-top slapstick. There is also a certain level of unexplained zaniness and a few really confusing cuts that made me wonder if the episode was cut down from a slightly longer special. The ending, for example, seems to come out of nowhere and makes no sense. I couldn't find any information about it, though. It could easily just be poor writing. Lindsay got her review in first. Normally, we don't gang up on a movie if we both hate it, but this gets to be a special case. 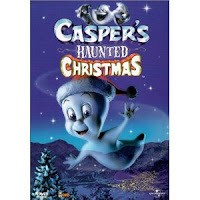 It's Christmas, so I'm going to start this review off on a positive note by finding some nice things to say about the computer animated, direct-to-video film, Casper's Haunted Christmas. Give me a minute. I can do this. Got it! The ghosts were animated with passable CG, unlike the people (more on that in a moment). Also, the design of the fictitious town this took place in was kind of fun. This concludes the positive section of this review. Going in, I assumed this was going to be bad. 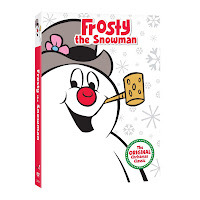 I mean, I bought it as part of a five dollar bargain set from Best Buy - the now infamous "New Christmas Classics" - and it wasn't even featured. I mean, this is (unfortunately) a full length movie, and the people including it in their set didn't feel like it warranted more attention than a bunch of seven minute Gumby shorts. Oh. I feel quite unpleasant now. This is one of the worst pieces of utter tripe that I've seen in a long time. First off, the animation is awful. The movie is full of creepy CG people who just look hideous. The ghostly effect isn't terrible, but everything is animated poorly. The plot is utterly arbitrary. At the beginning it seems that Casper's uncles (aka The Ghostly Trio) are about to get in trouble for scaring a parking lot full of people... but wait, then Casper's in trouble for not scaring people? Make up your mind. The “plot,” so to speak, is completely imposed upon the characters with utterly no rhyme or reason. They are sent to “Kriss, Massachusetts.” Shoot me now. Given the vast number of Christmas specials I'm sitting through, I can't think of higher praise than what I'm about to say: this hour-long special felt short. While there's certainly some bad Powerpuff Girls cartoons out there (seasons 5 and 6, I'm looking at you), the majority is very, very good. And this represents some of the best. Even before the action picks up, just watching the Powerpuffs decorate is immensely enjoyable. So much of what made the show a success was the contrast between childhood and super powers, and that's certainly on display. The story involves Princess, who breaks into Santa's workshop to alter the naughty/nice lists. It's well put together and fast paced, leading up to a world-spanning battle. Huh. I remember Tiny Toons being funnier than this. 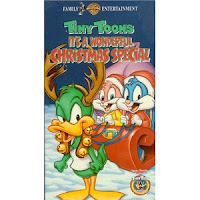 The Tiny Toons Christmas Special is okay, but not great by any metric. It's cute, not smart. The story is completely straightforward: a passable riff on It's a Wonderful Life. Where it really fell flat for me was an excess of jokes based on parodying celebrities. I didn't get these jokes back in 1992, and now they're really dated. That said, there was a good bit of the meta-humor that Tiny Toons was known for, all based on the awareness of being in a cartoon. The visual of Buster thinking of throwing himself "out of the cartoon" is particularly nice. His rabbity angel is named Harvey. If you're after specials from cartoons you may have watched in the 90's and you can't find any Animaniacs, or you still think Cher jokes are funny, this might warm the cockles of your heart. If not, stick around, I'm sure I can recommend something more timeless. 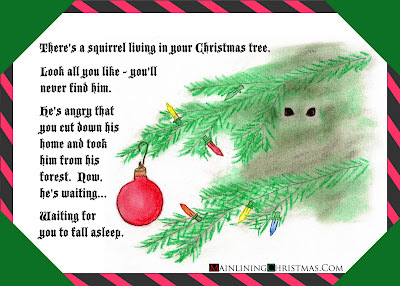 Part of my relationship with the Christmas season can be explained, not with food or family, but with a song. I grew up in Massachusetts. 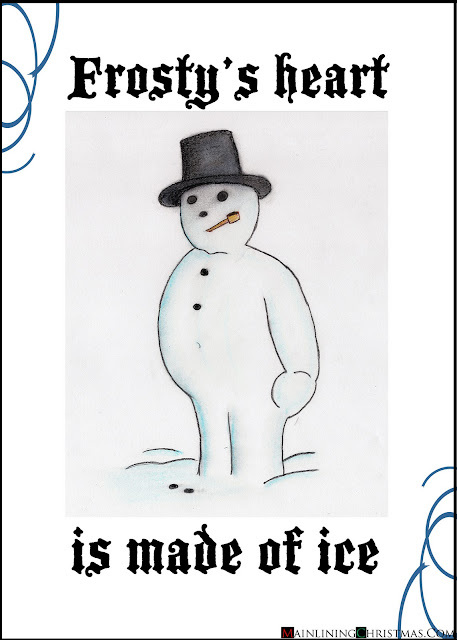 The Northeast is a good place to be for "traditional" Christmas: We usually got snow, my parents' house was set back in the trees, we had a big fireplace for Santa's presents, and there were the occasional town or school parties that actually had things like carols. However, my favorite part of my parents' Christmas tradition was driving into Boston for one night to see the lights on Boston Common and the animatronics in the store windows. We would also drive around the smaller urban areas nearby, wherever there were lighting displays and holiday music in the streets. My second favorite part of Christmas was music, and my favorite song since I got too old for Rudolph (at about 6) was Silver Bells. 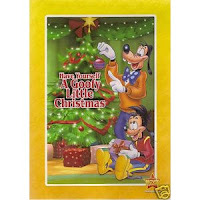 I never had cable growing up, so "A Disney Channel Christmas" isn't a special I'm familiar with. Apparently, Disney has been re-cutting and adjusting this since 1958, when it was called "From All of Us to All of You." 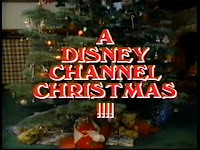 The version I saw, expanded to a numbing hour and a half, was released in 1983 and titled "A Disney Channel Christmas." To today's viewers, most of this plays like an extended commercial for Disney DVDs. It's easy to forget that most of the movies and clips featured wouldn't have been available for sale when this aired. For a number of viewers, this would have served as an introduction to characters and movies they wouldn't see for years. Now, the clips feel bizarre and esoteric. Scenes from Pinocchio, Snow White, and Cinderella are included, despite the fact there's no discernible connection to the holidays or even winter. I only spent one year working in retail at Christmas. About eight years ago, right after I finished college, I spent a year selling arts and crafts at a Michaels in western Massachusetts. There were a lot of things I hated about that job. For one, it wasn't exactly the sort of thing I'd imagined myself doing with my degree. Also, about one in every three customers was certifiably insane. I once had a hippie ask me how often we had to water the artificial trees. However, I have to say that, despite everything, I really loved working around Christmas. The hours extended, so I was there until after 10 half the time. The seasonal Christmas merchandise was coated in a layer of glitter so thick that by the end of some days I looked like I'd applied it to myself (good thing that was before the days of Twilight: I'd have hated being mistaken for a cosplayer). And they'd play the same half dozen cheesy Christmas songs day in, day out. Man, I loved this when I was a kid. We had the Disney Channel when I was little, back when it was the channel that showed wall-to-wall old Disney Cartoons and "tween" programming wasn't yet a glimmer in a marketing director's eye. I watched all the Disney Channel Holiday Specials. There was one for Christmas, and one for Halloween hosted by the Magic Mirror from Snow White, and one for Valentine's Day, and maybe some that I'm forgetting. They are essentially themed clip shows, but sometimes it would be the only time you would see some of these bits. 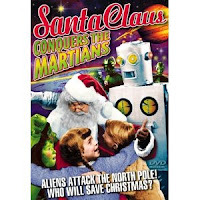 Not to be confused with the classic "Santa Claus Conquers the Martians," this is an hour-long Christmas special about a ridiculously small group of Martians coming to Earth to blow it up. I'm assuming this was intended to be shown on television, though I'm having a hard time finding evidence it actually ever aired. There's no Wikipedia page up for the special, and the page for PorchLight Entertainment, the company which made it, reads like it was written by someone working for the company. Or their mother. All things considered, this really isn't a bad special. 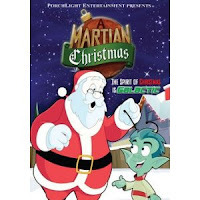 There are some solid jokes surrounding the Martians' misconceptions of Earth based on television broadcasts, as well as the similarities between the little green men from Mars and Christmas elves. Plus, they're ostensibly here to blow up the Earth, which always makes for good comedy. 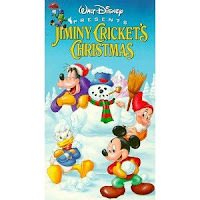 This is one of four specials included on a DVD I fished out of the bargain bin at Best Buy labeled, "The New Christmas Classics." I'm not exactly sure what qualifies all of these as "New", let alone "classics." If the internet is to be believed, The Fat Albert Christmas Special premiered in 1977, so it's been around for a while. I put this on not having any idea what to expect - if I've ever seen an episode of this series before, I was too young to remember. All right, let's get this out of the way. This special is boring. Not mind-numbing or painful, but it definitely drags. The comedy doesn't help, either. I don't know if the jokes are just anachronistic or what, but they didn't age well. I don't remember a time that I believed in Santa, I mean really believed. I spent a long time sort of believing in a "non-personified force of seasonal charity" that was conventionally understood as Santa, but I don't remember ever thinking that a literal person delivered gifts to the children of the world. This position may have been prompted by the simple fact that 'Santa's' handwriting looked, well, exactly like my Dad's. 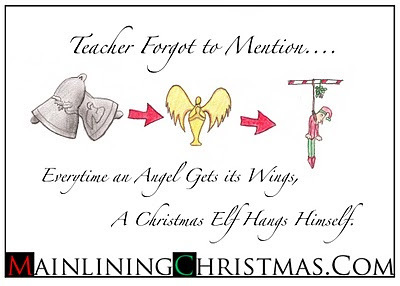 Did other kids get letters back from Santa? Sometimes I thought it was just to explain why we didn't get what we asked for, but something else instead. Or by the fact that while my parents said they wanted me to believe, and they made my brother and I go through the motions for a long time, it never quite seemed like they could get through the routine without seeming patronizing or winking. At some point, I had had it.